Would you believe me if I told you I felt a bit "ho hum" about the PlayStation before I laid eyes on Final Fantasy Tactics? Well, it's the truth. Oh, other games--like Final Fantasy VII, Jumping Flash and even Ridge Racer--piqued my interest in the system, but none of them prompted me to go out and buy Sony's boxy, gray console like this one did. 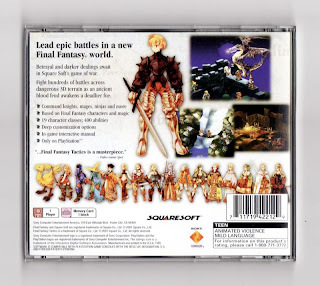 As for why I found Final Fantasy Tactics more appealing and irresistible than the aforementioned games: Well, I can't remember exactly--it has been 13 years, after all--but I think it had something to do with this title's Final Fantasy V-esque job system. I also recall being intrigued by its big, showy spells and strategic battles. 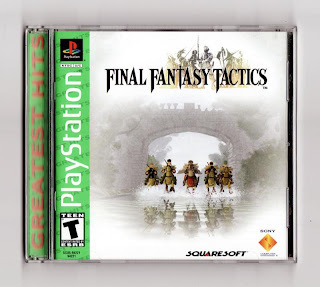 There's more to Final Fantasy Tactics than those three back-of-the-box bullet points, of course--like a complex, convoluted and controversial (thanks to its negative depiction of religion in general and the Roman Catholic Church in particular) plot. Also, there's a bevy of controllable characters, an impressive array of battle locales and a beautiful, as well as memorable, soundtrack (composed by Hitoshi Sakimoto and Masaharu Iwata). So, what's wrong with Final Fantasy Tactics? Not much, if you ask me. In fact, I can think of only two things that could turn off the odd gamer: First, it can be confusing at times (thanks to the above-mentioned backstory) and, second, it can be brutally difficult. 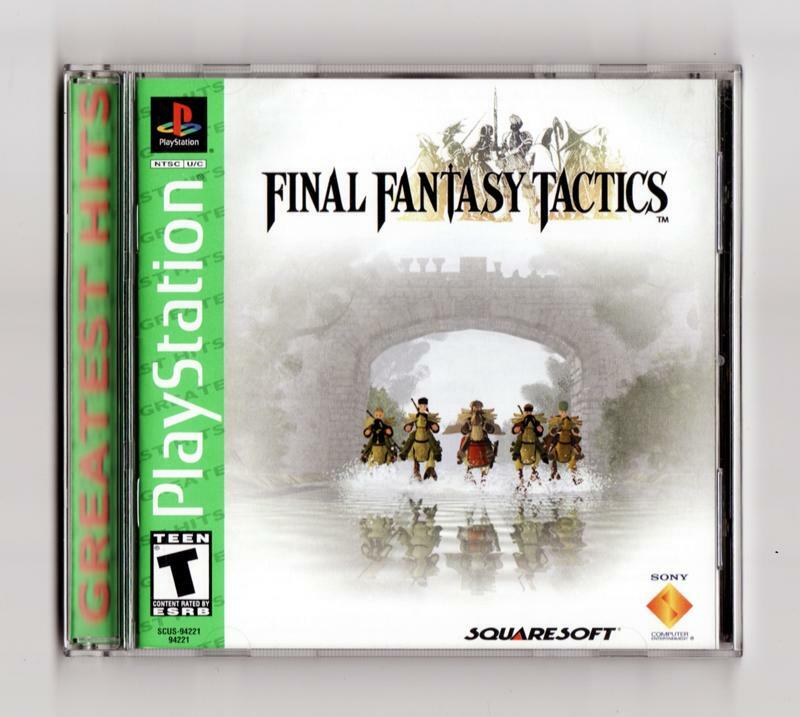 Don't let those negatives keep you from giving it a go, though, as it's easily one of the best games ever released for the PlayStation--or for any system at all, really, especially if you're a fan of strategy RPGs. I guess I might should give this one a shot, huh? I'm still waiting on Hot Shots Tennis to get here...Amazon said the delivery date was tomorrow. I expected it today, since Amazon stuff gets to my house almost instantaneously, for some reason. But...no dice today. What else is there to say about FFT, really? I think you pretty much nailed it. If you're a fan of Strategy RPGs, or if you're interested in getting into them, there's no finer choice than this game. It also helps that there's a HUGE online community, so if you're having trouble or get stuck, there's bound to be a knowledgeable person out there to assist you. There is a minor slowdown issue in the PSP version when using some special moves, but I think the added content and more coherent translation more than makes up for that. Apparently the iOS version has been delayed, though! Just until late July, so at least it isn't a long wait for those holding out on it. Thanks, Kamiwoo! I didn't know about the slowdown in the PSP version. I'll sure I'll still buy it regardless, but it's good to know about it in advance. I had forgotten about the iOS version. Does it include the extra content, etc., from the PSP release? Really, Anne? I can't wait to hear what you think of it :) I hope to get the PSP version myself at some point, along with the PSP remakes of FF 1 and 2. Bryan, I believe the iOS version includes all the new job classes and the like from the PSP version, but lacks the multiplayer aspect. Since some of the items could only be acquired via multiplayer battles in the PSP version, I'm not exactly sure how this will work out on the iPhone/iPad releases! Hopefully this will be clarified soon. Ah, that's interesting, Kamiwoo. It'll be interesting, then, to see how Square deals with some of the multiplayer-only items in the iOS version, then.